Join us for an exceptional new journey to India and visit seven World Heritage sites, discover diverse cultural traditions, and treat all of your senses to a succession of stimulating experiences that only this fascinating country can deliver. You’ll stand in awe at the ethereal beauty of the Taj Mahal in Agra, Delhi’s massive Red Fort, and silent, deserted Fatehpur Sikri, a perfectly preserved example of a Mughal city. Explore the impressive princely capitals built by maharajas, with their breathtaking regal palaces, fascinating museums, forts, and even an astronomical observatory, in the “pink city” of Jaipur, “blue city” of Jodhpur, and Udaipur, the “city of lakes.” And to better experience the very best of these imperial capitals and remote but fascinating places, you’ll travel in comfort for five nights aboard the Royal Rajasthan on Wheels, a luxury train designed to recreate the splendor of the royal maharajas. Depart home on an overnight flight to Delhi. Arrive on January 23 and transfer to the hotel. Enjoy a welcome reception and dinner this evening. Old Delhi, the capital of Muslim India for seven centuries, consists of eight different cities built by a succession of empires. New Delhi was created as the capital of India by the British in 1911, and is the epicenter of contemporary Indian political activity. In Old Delhi, visit Red Fort, surrounded by shops and bazaars; Jama Masjid, the largest mosque in India, with its tapering minarets and marble domes; Chandni Chowk, the city’s bustling and colorful market dating back to the Mughal period; and Raj Ghat, Mahatma Gandhi’s memorial site. In New Delhi, designed by Sir Edwin Lutyens during the period of British colonialism, see the India Gate, a memorial to Indian soldiers killed during World War I; the red sandstone and marble Qutub Minar, the tallest minaret in India and a UNESCO World Heritage site; and Humayun’s Tomb, the architectural forerunner of the Taj Mahal. After a morning at leisure in Delhi, fly to the “blue city” of Jodhpur, famed for its indigo-washed buildings (traditionally homes of the Brahmins) cascading over the hills, its sunny climate, and its beautiful architecture. In the evening visit the maze of narrow medieval streets and bazaars with its tea and spice shops, beautiful bolts of fabric, and a variety of Rajasthani handicrafts. Venture into the countryside to learn about village life. Watch craftsmen, including weavers and potters, practice their trades and visit the Bishnois community, where all animal life is considered sacred and wildlife protection is part of daily life. See how Blackburn antelope, gazelles, and numerous species of birds live in harmony with the local inhabitants. In Jodhpur visit Jaswant Thada, an architectural landmark constructed entirely of carved sheets of marble. A traditional cremation site of Jodhpur rulers. It was built in memory of Maharaja Jaswant Singh in 1899. The grounds include beautifully carved gazebos, a multi-tiered garden, and a small lake. Massive Mehrangarh Fort, built on a hilltop in 1459, is comprised of a variety of royal palaces with collections of priceless jewels and armor. Located on Chittar Hill, the highest point in Jodhpur, Umaid Bhawan Palace is part royal residence, part museum, and part hotel. In mid-afternoon board the Royal Rajasthan and depart for Udaipur. Royal Rajasthan on Wheels. Disembark the train and visit Agra Fort, a UNESCO World Heritage site that dates back to at least 1080 A.D. This spectacular walled city contains a maze of courtyards, mosques, and private chambers built by Emperor Akbar. In the afternoon, visit the Taj Mahal, the magnificent expression of Emperor Shah Jahan’s love for his wife, Mumtaz. En route to Bharatpur, stop at the UNESCO World Heritage site of Fatehpur Sikri, the deserted imperial capital built by Emperor Akbar in the late 16th century and a perfectly preserved example of a Mughal city. 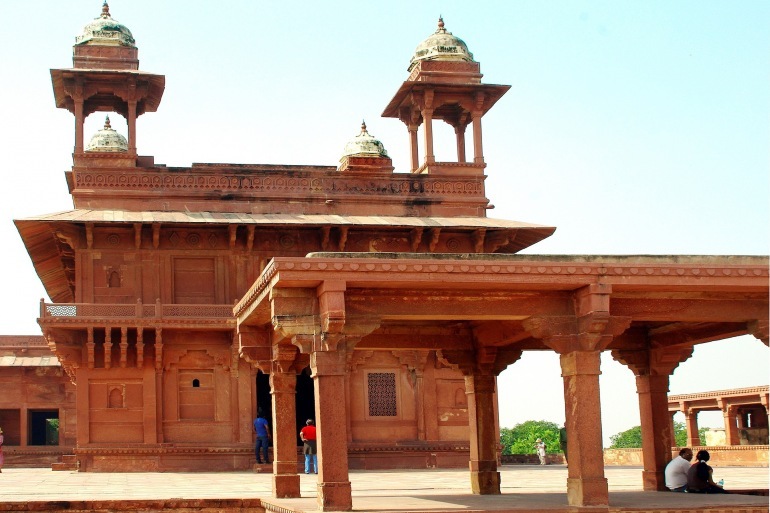 Fatehpur Sikri was abandoned after only 14 years due to the lack of an adequate water supply, and its audience halls, palaces, courtyards, pools, and enormous mosque remain nearly untouched by time. Continue to Bharatpur for a visit to Keoladeo Ghana National Park, a UNESCO World Heritage-designated bird sanctuary renowned for massive flocks of egrets, Siberian cranes, migratory water fowl, and many other species of birds. Originally a private hunting reserve of the Maharajas of Bharatpur, the marshes were protected and developed in the late 19th century to attract waterfowl, and now more than 230 species of birds make this park their home. Drive to Delhi and check in to day rooms at an airport hotel to relax and freshen up before boarding late-night or early-morning flights, arriving home on March 1. Expertise of a Smithsonian Journeys Expert, Tour Manager, and local guides throughout the tour. Meals, including special Welcome and Farewell Receptions, as noted in the itinerary. Complimentary house wine, beer, and soft drinks with lunch and dinner while aboard ship. Baggage handling and transfers abroad on the designated program departure and arrival dates. Port fees and embarkation taxes. Personal items such as room service; email, telephone, and fax charges; laundry; gratuities for non-group services; and other items of a personal nature.